A new exhibition from Room 13 Community Studio at Caol Youth Centre will feature a series of amazing portraits of local people. 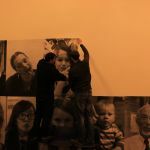 The portraits are part of a global photography project called The Inside Out Project, which aims to transform messages of personal identity into art. The black and white photographic portraits capture the emotions and feelings of the subject to reveal and share untold stories. The aim is to portray the vibrancy of local life and in doing so promote equality and community spirit. Room 13 Community Studio at Caol Youth Centre is first place in Scotland to participate in this global project, which has seen portraits displayed in more than 100 countries. Local people had their photos taken by young volunteers at special sessions held in Room 13 Community Studio. A number of these images were then sent off to Inside Out project HQ in the USA where they were printed in large scale, and sent back to Caol Youth Centre to be put on display. Room 13 Artist in Residence Sarah Hughes co-ordinated the project with support from volunteers from Caol Youth Centre Duke of Edinburgh Award Scheme. The opening of the exhibition will take place at Caol Youth Centre on 18th March. Press viewing from 6pm. Caol Youth Centre: Large scale portraits will be displayed in the windows of Caol Youth Centre, and more will be exhibited in areas inside the building, including the café bar. 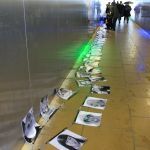 Fort William Underpass: The portraits will be exhibited in the form of bunting, which will be strung between banner posts for passers-by to see. Kilmallie Free Church: Portraits will be on display in the church and café. Room 13 Community Studio Project is part financed by the Scottish Government and the European Community Highland LEADER 2007-2013 programme. We now have a gallery of photos up on our facebook page. Go and take a look at the fantastic opening night held at Caol youth centre.